Clarendon is a fictitious line in British environment. There are both passenger trains and freight trains alternatives for this route. There are also night alternatives in compact darkness. Detailed route when it comes to trackside details and realistic signaling. Soft curves and some details in the mostly rural landscape. In the 2 coal freight alternatives, a ghost train immediately appears at the same track as the train to be driven. Let the ghost train disappear in the distance, and you can the run the route normally. A fictitious railroad in American desert environment. Select from 5 alternatives: Two alternatives are freight trains, something rather unusual in OpenBVE, of which one daytime and one night alternative, both for train hauled by the diesel/electric engine class GP-38; Another 2 alternatives are passenger trains hauled by the class GS-4 steam engine, of which one is an express train and one a local train; Finally also a night time mail train hauled by the class GS-4 steam engine. 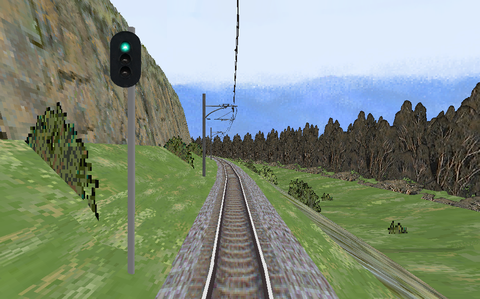 Correct signal aspects, many graphic objects trackside and in the landscapes. This route was distributed at the website Train Sim Central . That website has disappeared from the Internet long, long ago. 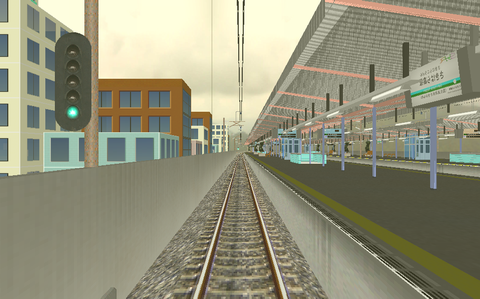 This is something rather unusual in OpenBVE: A freight route. The line is fictitious but the scene is an Australian line through mountainous terrain. The task is to drive 3 000 metric tons freight train with 30 coal-filled hopper cars from the COALEX terminal in Lithgow to its destination in Penrith. The route goes through the Blue Mountains, so there is the problem of pulling the freight uphill and then not to let the train overspeed downhill later on. 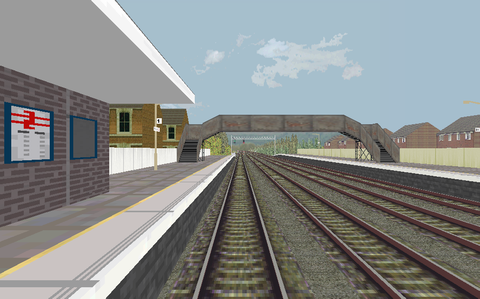 This BVE simulation is from the year of 2001, but it is still a good freight route. See the creator's file HeavyCoal.doc located in the route's directory. It contains a description of the scenario, and driving instructions as well. This route and train were posted to the Internet 17 years ago, and the website for the route has disappeared at least 10 years ago.